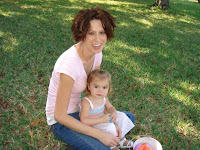 I am about to turn 30, my baby just turned one and I am still carrying around extra weight. I would like to lose some more of this extra weight before the cruise, so that I can feel good about myself and enjoy it even more. I actually don't have a ton to lose weight wise, but the inches around the middle need to be worked on. It is not a huge secret that I have struggled with self-image issues for a majority of my life and it is an ongoing battle for me still. Yes it is true that I grew up being SUPER skinny, and yes I know that I am not fat now, but I am however still not able to get into most of my pre-pregnancy clothes, which makes me feel not so great about myself. Will most of you read this and think that I am crazy? Probably. But, I thought that by me posting my goal to start a workout routine, it would keep me motivated to stay on it! This was me when I was 23 years old and got engaged to Matt. I weighed 120 lbs and I am 5'11. The sad thing is that I use to cry all of the time about how fat I was. (Scary, huh?) Matt put up with a lot! 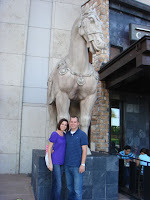 I got pregnant 9 months into our marriage and boy did I enjoy it! I ate EVERYTHING in sight. Seriously I never stopped eating for those 9 months! 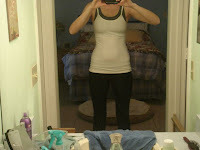 Everyone told me that I was so skinny and it would be so easy to lose the baby weight. I of course, never really having worked out in my life, believed them. I gained close to 60 lbs. This is a picture of me the morning I went in for my induction to have Mattie. Counseling changed my life! I was able to address my demons and recognize that I had an eating disorder. Matthew was a very patient and loving spouse through out it all, and I am so grateful to have him for eternity. After finishing counseling, I was able to move on, but not without struggles and fighting. We decided it was time for another baby. 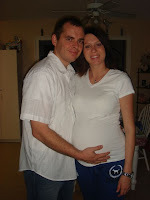 It took us almost a year to get pregnant and this time I started out at 130 lbs, a much healthier weight. I knew that I would be at risk for going through the depression and old eating disorder habits again. I tried to be a little more strict this pregnancy, but still ended up gaining 40 lbs. This was me the morning of my induction for Reddin. I am happy to say that the obsession with losing weight and feeling crappy about myself ALL of the time never came. Yes there have been many times in the past year where I have looked at my body in the mirror and longed for my 130 lb frame, but I was never consumed by it. I knew that I was able to lose it once, and that I would be able to do it again. So the problem is my baby is one now and I have not gotten into a great exercise routine! I thought for sure I would lose it all by the time Reddin was a year old, but I just haven't worked at it. I have exercised here and there some, but never really "worked" at it. I do know what I need to do, I just haven't had the motivation... until now! Hello I am turning 30 next month and going on a cruise! I want to feel some what good in a bathing suit! Matt is terrible and doesn't help the situation at all, constantly telling me how much he loves my body how it is. Geesh what a guy! I think that this will motivate me to actually start working at it! Do I think that I will be in the best shape of my life by February 8th? No way! I do however hope to feel a little better about myself, so that I can truly enjoy my cruise with the hubby and embrace turning 30!!! For some reason this isn't in my Reader yet. I didn't know this year is your 30th! Your cruise sounds like such a fun way to celebrate. Good luck with the workout goal. I'm right there with you trying to make that routine. Oh Heather, I am with Matt - you are beautiful the way you are. =) Your cruise sounds super fun. Josh and I really like going on a cruise, I hope you guys do too. I will agree with you that turning 30 is scary, it has always been the dreaded age for me where I think I will no longer be the young mom. Good luck on your workouts, start them after this weekend. Ha Ha! First of all, in my opinion, you look great. BUT you are the one who lives with your body every day. Have you tried the P90X workout? It is awesome!! I will be doing it after I have this next (and last) baby. Good luck and have a great time on your cruise! Happy Birthday!! Facing demons truly is hard. I can't seem to face up to mine. I applaud you for your bravery to face them and post them. I wish you the best of luck. I'm glad you get to go on a cruise for your birthday and the 30's really aren't so bad and I'm not saying that just because I'm close to my 40's!! How fun that you'll get to go to the Bahamas! I'm with you though, turning 30 terrifies me, I have loved being in my 20's. I was surprised how upset I felt to realize my next birthday is the big 3-0. I just realized we're both turning 20+10 in 2010 (ha I'm a nerd). I love your honesty and bravery--but I must say you've definitely gotten MORE beautiful with age! I know I'm echoing what everyone else has already said, but you are already beautiful. I however completely understand. We just hit the 1 year post birth mark, and I am nowhere near where I'd like to be. You've given me the motivation to do what I need to(baby step wise) to fit my pants better. First of all--jealous that you are going on a cruise! Second, I understand your frustrations and anxiety! I grew up fat, though, and have never really been where I wanted to be weight wise. At the start of my pregnancy I was 20lbs heavier that I was when Alex and I got married, so I wasn't feeling great about myself (um...would kill to be as skinny as you! 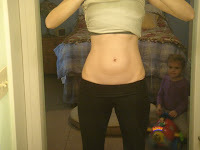 ), but add this baby weight too, and I'm going to be looking to get it off sooner rather than later too. Maybe after the baby comes, you and I can work together toward a common goal like running in a race or something. Probably would be after your cruise, but I find having something to work toward and working toward it with someone helps. We'll talk! Good luck, Heather! Admire your honesty and openness with yourself. I could say that your are gorgeous just the way you are because that is truly what I think. As a friend, though, I'm sure you don't want to hear that. So I will say... Good Luck! You can do it! By the way, I loved my 20s too but I am loving my 30s even more!! I've been here for a few years now. I feel like I know more about myself now than I did in my 20s. You'll love it!! As I have aged I've learned that one's calendar age DOESN'T matter. It's how you feel inside and act on the outside. Have fun, laugh, eat, sing, dance, love!!!! Remember our eternal bodies are perfect - so enjoy this mortal body! Did you know that the truly beautiful Greek Goddess's all had a "baby belly". Look at the statues! It's your badge of motherhood! (Even though yours is TINY) Wear it with pride! Yeah, I'm with mom... that Grecian body just works--but that waist of yours is to.die.for. And you don't have the oogly googly wiggly jiggly c-sec leftovers. Nothing will take mine away! Yes, you do have to feel comfy in your own body, also realizing that your self esteem and self worth comes from other means besides body image. Your candidness is refreshing. And 30's are better than 20's!!!!! Embrace it, babe!!!! Good luck! You'll feel great just because you've done something, you look great anyway! I still feel 24 too and I'll be turning 32 on Sunday. Just think how we'll still feel 24 when we're 80, but that just goes to show that the spirit never ages, just gets wiser! Enjoy your cruise! If you and Erin decide to work toward a common goal like a race, I would LOVE to join you. It would be great motivation for me to exercise! Let me know if you guys do decide to do something like that!